Caltech researchers advance technology to harness the lost energy from photovoltaic cells; in other efforts to find new ways to harness solar power, Southern Illinois University Carbondale researchers are finding ways to tear down geodesic domes at the molecular level and use the parts in ways they say have never been attempted. As solar panels become less expensive and capable of generating more power, solar energy is becoming a more commercially viable alternative source of electricity and today’s photovoltaic cells can only absorb and use a small fraction of that light, which means a significant amount of solar energy goes untapped. However, a new technology created by researchers from Caltech represents a first step toward harnessing that lost energy. In a traditional solar panel, silicon atoms are struck by sunlight and the atoms’ outermost electrons absorb energy from some of these wavelengths of sunlight, causing the electrons to get excited. Once the excited electrons absorb enough energy to jump free from the silicon atoms, they can flow independently through the material to produce electricity. This is called the photovoltaic effect—a phenomenon that takes place in a solar panel’s photovoltaic cells, the researchers explained. And while silicon-based photovoltaic cells can absorb light wavelengths that fall in the visible spectrum, longer wavelengths such as infrared light pass through the silicon. These wavelengths of light pass right through the silicon and never get converted to electricity—and in the case of infrared, they are normally lost as unwanted heat. The team has found a way to absorb and make use of these infrared waves with a structure composed not of silicon, but entirely of metal based on a phenomenon observed in metallic structures known as plasmon resonance. Plasmons are coordinated waves, or ripples, of electrons that exist on the surfaces of metals at the point where the metal meets the air. In other efforts to find new ways to harness solar power, Southern Illinois University (SIU) Carbondale researchers are finding ways to tear down geodesic domes at the molecular level and use the parts in ways they say have never been attempted. Former SIU professor, design and geodesic dome guru and sustainability advocate R. Buckminster Fuller would likely approve of. The researchers, are finding ways in the laboratory to break down so-named “Buckminster Fullerenes,” soccer ball-shaped molecules known for the ability to accept free electrons under certain conditions. The molecules, first created in a lab in 1985, are named after the world-famous Fuller, who taught at SIU from 1959 to 1970. They are doing fundamental research – making discoveries that formulate the basic building blocks of scientific knowledge with the ultimate goal of finding ways to improve solar energy conversion efficiencies in photovoltaic cells. 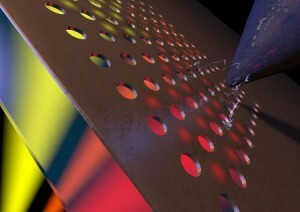 The basis of the research involves using organic-based semiconductors. The whole idea for such cells involves combining two different types of organic semi-conductors, one of which will give up electrons while the other tends to accept electrons. When the two materials are combined in a solar cell and then exposed to sunlight, electrons will flow from one region to the other, thus creating a current that can be stored as electricity in batteries as part of a solar power system.